Unit One is a long-standing Nordic Noir series depicting the day-to-day lives of a group of staunch crime-fighting experts from an elite unit within the Danish police force (The Danish equivalent of the FBI). Throughout the series we follow their fascinating, frightening and dangerous work within the Danish underworld and witness their unflinching commitment and solidarity when pitted against the darkest extremes of human nature they fa..
Unit One (Rejseholdet) is a Danish television crime series starring Charlotte Fich and Mads Mikkelsen, Produced by Danmarks Radio (DR), the producer of the BAFTA award wining series' The Killing and Borgen. 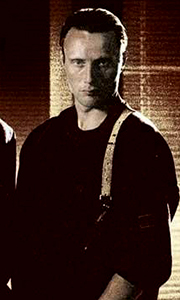 The entire series revolves around an elite mobile police task force called “Unit One” that travel around Denmark helping local police divisions solve sensational crimes, with the cases being based upon actual true-life incidents, suc..
Unit One (Rejseholdet) is a Danish television crime series starring Charlotte Fich and Mads Mikkelsen, Produced by Danmarks Radio (DR), the producer of the BAFTA award wining series’ The Killing and Borgen. The entire series revolves around an elite mobile police task force called “Unit One” that travel around Denmark helping local police divisions solve sensational crimes, with the cases being based upon actual true-life incidents, suc..